Joyetech has started the year with a new pen in the eGo line-up with an MTL device for beginners moving from smoking. It’s incredibly portable and… tiny! 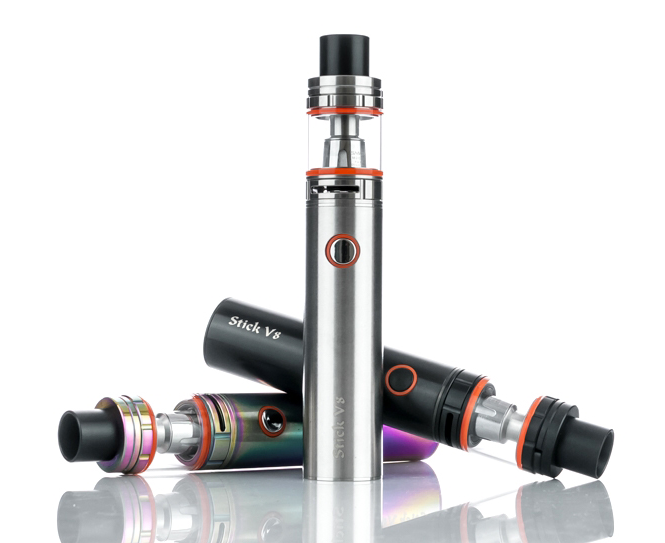 The Joyetech eGo AIO ECO Kit is a Starter Kit in the style of an all-in-one vape pen and optimized for high nicotine. It’s also tiny and comes with two drip tips, one with two small holes and the other with two slightly larger holes. It has a dual circuit battery protection system to stop over-charging, over-current and over-discharging. Charging is to a capacity of 650mAh via USB so you can use your computer or the nearest wall socket indicating a full charge when the light goes out. 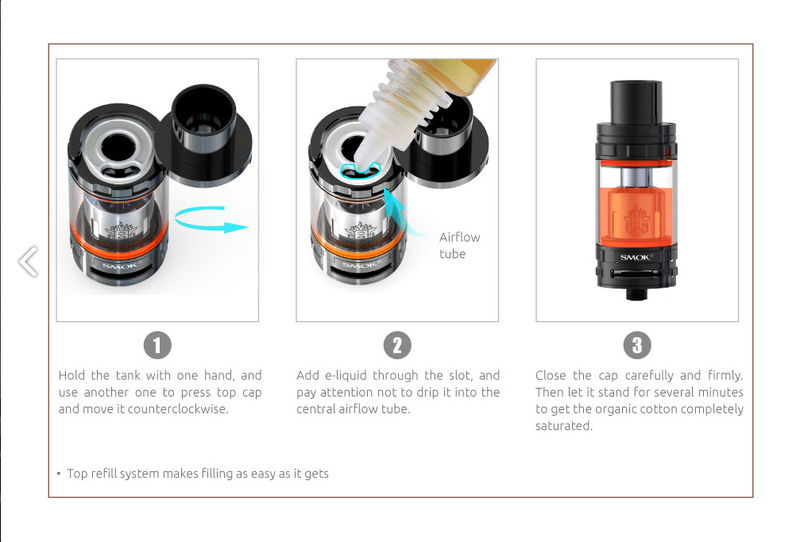 To fill with e-Juice (only 1.2ml) requires unscrewing of the mouthpiece, then you can fill the e-juice directly. It comes with seven different colored lights that you can change after pressing the fire button for 5 seconds, giving you red, yellow, green, blue indigo, white and purple. The Joyetech eGo AIO ECO pen also comes an array of five colors of Red, Blue, Black, Grey, Green. Voopoo impressed our team and many other reviewers with the release of their Voopoo Drag. 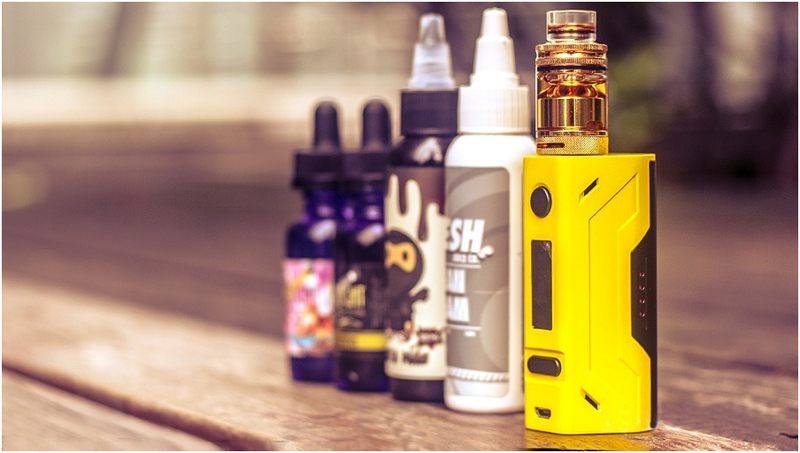 The TOO box mod challenges traditional design with sliding battery doors and is aiming to provide flexibility to the user with the ability to use either single or dual 18650 to power it. Is it just another vape gimmick or will this prove to be a competent and useful design and make the TOO surpass the popularity of Voopoo’s DRAG? 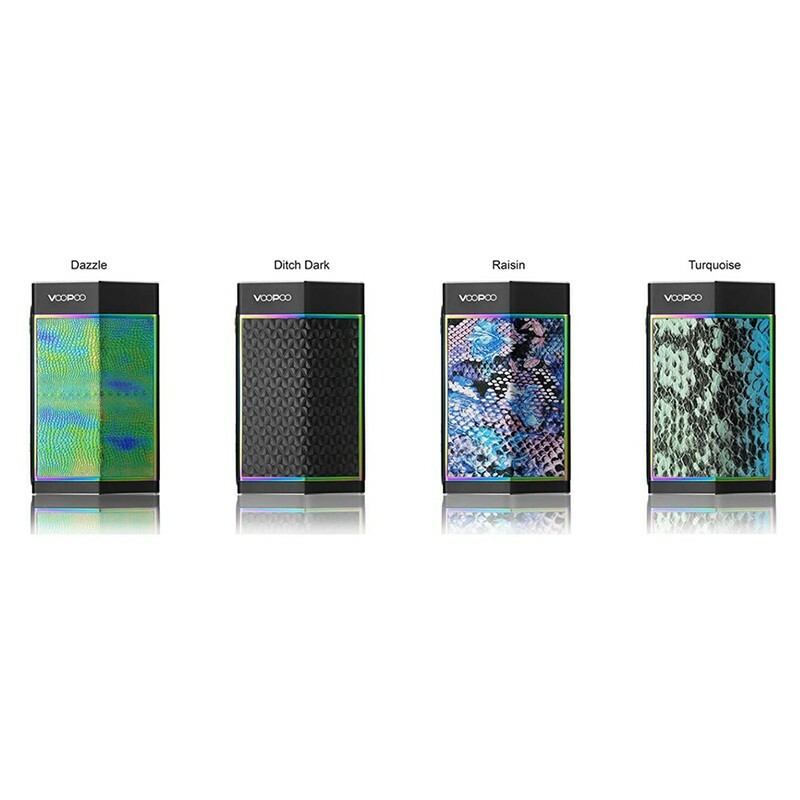 Voopoo has decided to break from the norm of traditional box mods that offer single or dual battery configurations, and offer both options making a more versatile device. The TOO can accommodate both a single and dual 18650 setup depending on your choice. This means the TOO can power up to 180 watts in dual mode and 80 watts when using a single battery. The battery compartments are concealed on either side of the device by innovative side panels or sideslips. The TOO is fitted with an updated version of the impressive and efficient Gene chip, and Voopoo guarantees the fastest firing of only 10 milliseconds! This remarkable response time is supported their full configuration suite and various operating modes, including a “SOFT” mode for improved outputs at high powers – a feature that aims to prolong the lifespan of pre-made coils. Voopoo’s previous release the Drag divided opinion with its old-fashioned box styling. The TOO is an all-around funkier looking device with fashionable accents on the double sideslip covers on an otherwise angular device. The main body has a professional CNC finish adding a premium look and feel. However, it still may prove to be hit and miss for some, but we like the fact that Voopoo is willing to try something different. 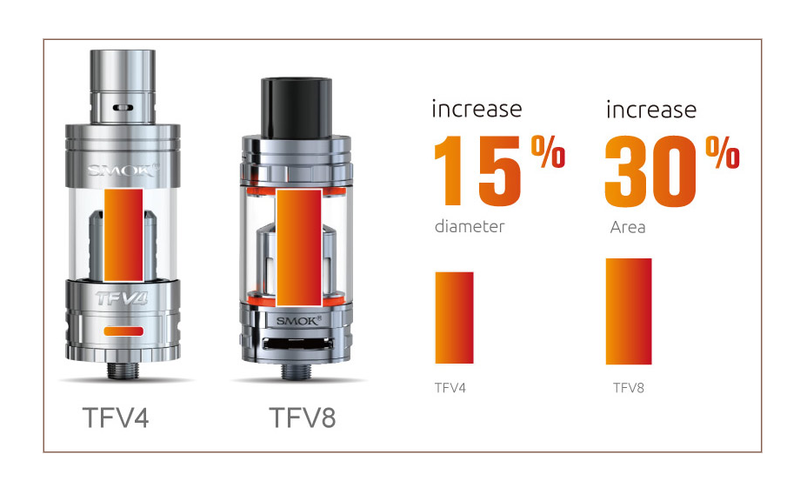 The SMOK TFV8 Cloud Beast Tank has improvements over the TFV4 across the board. SMOK took in a ton of feedback from actual users, and reviewers, and then went about creating the TFV8 Cloud Beast that would reflect the best of the feedback. 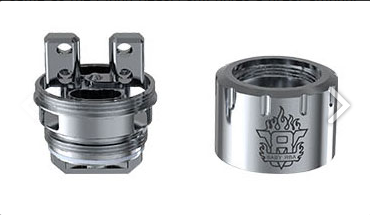 The airflow slots on the TFV8 increase intake by 18% from bottom airflow slots. 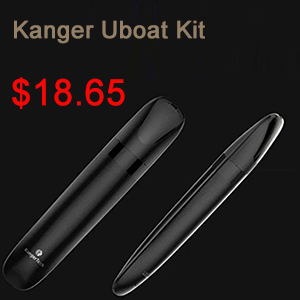 The airflow Tube was also increased, by a bit more than 30%, creating an unbelievable vape experience. filling, and because it was soft I was able to squeeze in the eye-dropper from the ejuice bottle easily, without muss or fuss. Still, everything can be improved, no? 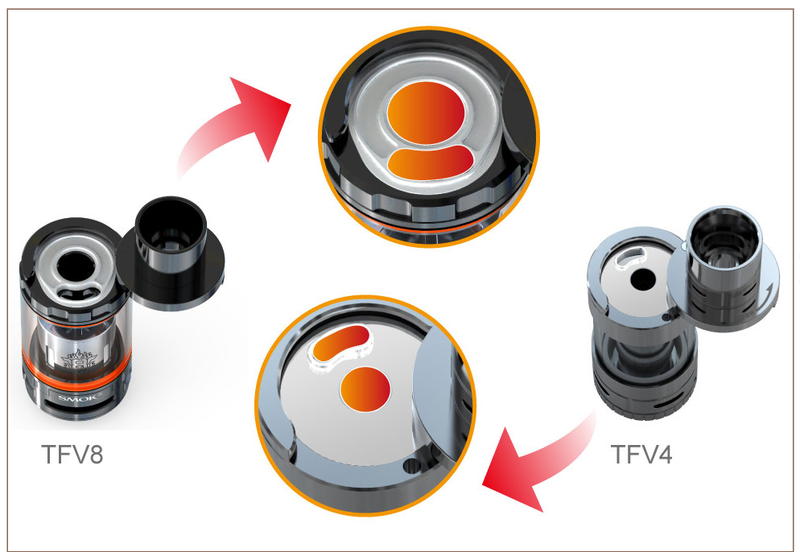 The Top-Fill system for the SMOK TFV8 is much the same of the TFV4, but the e-juice hole of the top-fill section has been enlarged some, to allow the user to insert eye-droppers even better. Some people I’ve spoken with that are huge fans of the older TFV4 say the new enlarged top-fill hole is great, but the old one was never a problem for me, but I’ll admit it’s a decent improvement. Make no mistake, the TFV8 is a large tank. Larger than the new Joyetech Ultimo, larger than the Vaporesso ORC tank, and even larger than the Uwell Crown 2, a large tank in its own right. The coil heads are massive, and the VT-V8 is intimidating as hell, but despite the size and the massive coil heads, the Cloud Beast is manageable, and makes a fantastic All-Day-Tank. 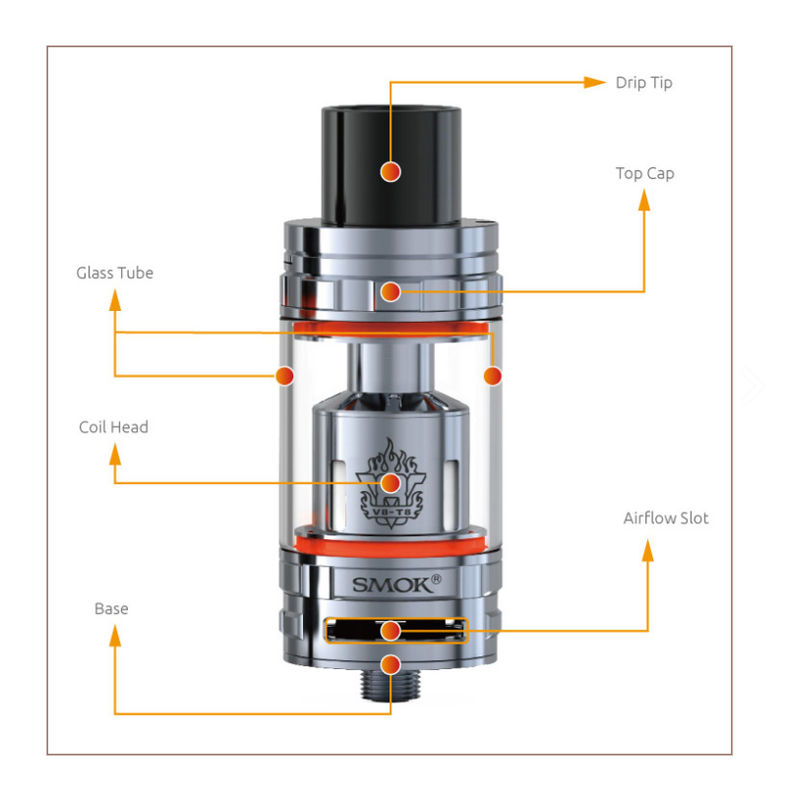 The fact that the SMOK TFV8 Cloud Beast is an all-day-tank, we need to keep in mind the power needed to drive the tank, and the huge amounts of ejuice it takes to keep a Vaper vaping. Each of the Coil Heads available for the TFV8 is rated for wattage, and this does provide some leeway into the power/ejuice needs. I’ll discuss the individual coil heads below, and I’ll let you know what to expect as far as battery life and ejuice usage for each one. The SMOK TFV8 launches with four coil head options, all using Kanthal A1 wire. While the RBA section includes a dual coil Clapton with Kanthal, you can use any wire with the RBA for Temperature Control vaping. But, at this time, the SMOK TFV8 is not for TC Vapers unless the RBA component is used with various TC wire (Nickel, Titanium, Stainless Steel). The highest wattage coil that comes with the SMOK TFV8 Cloud Beast package is the V8-T8, which can be vaped at up 260 watts with the right ejuice. The SMOK TFV8 Turbo Engines Replacement Coils use powerful cores. Patented by design and high-performance capability, they offer an unmatched airflow performance and incredible vaping experience. It should be noted that during the lifespan of the SMOK TFV4, SMOK introduced 15 different coil heads. SMOK just might do the same thing the TFV8, but I suppose that will depend on the sales numbers, initially and down the road. 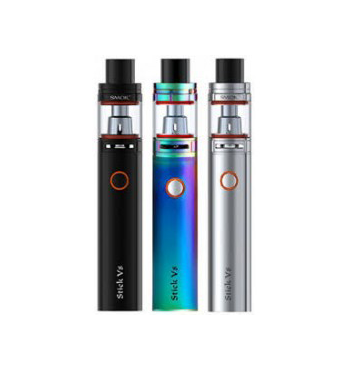 The most important question SMOK will have to answer is; Are Vapers using this tank long term or are Vapers picking one up for novelty or to add the most powerful Sub-Ohm tank to their arsenal? 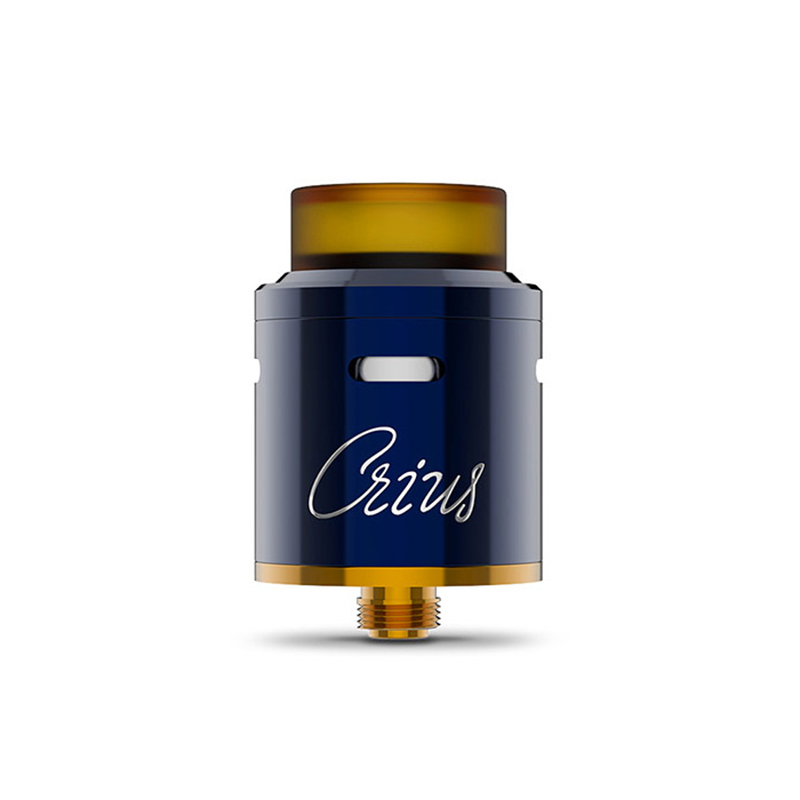 If the TFV8 is used as an all-day-tank, which it should, then coil head options are probably a sure thing. 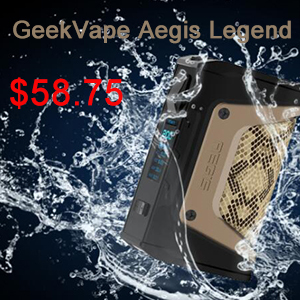 The three standard coil heads and the one RBA are all rated in wattage of at least 50w. The top-end of the wattage scale varies as to the coils in the heads, but maxes out at 260w. To vape at that wattage, you would have to buy one of the few 300w mods, something I hope to never do. The V8-T6 coil head is rated at 50w to 240 watts. 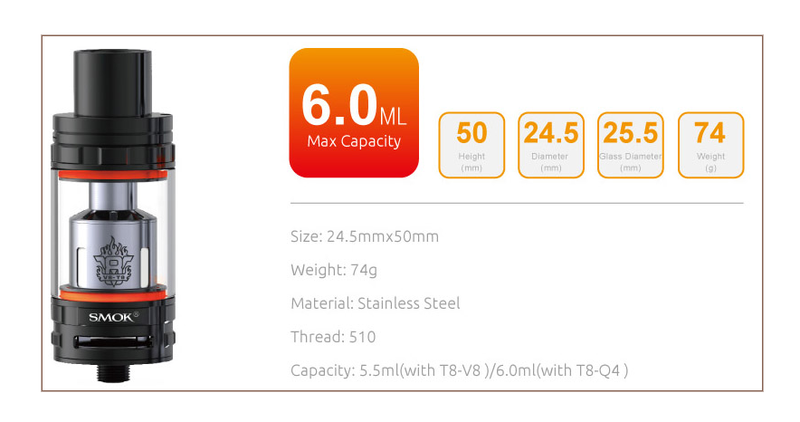 The ohms rating is 0.2, and the coil is made up of 6 separate coils, a patented design. This Turbo coil head might become the favorite among users because it can be used to create a great vape at about 90-100w. No doubt you’ll breeze through ejuice and battery life, but the flavor from this coil head, and the vapor production, will beat any prebuilt coil head on the market, except for the T8-V8. coils. SMOK tells us that this coil head delivers a super smooth and silky vape experience, similar to a Hookah. The last Hookah I used was the e-hookah by the new-defunct Triple 7 company. That device was, back in the day, a very decent vape, though now it would be so outdated I wouldn’t bother. Attaching the V8-Q4 to the TFV8 and using the Fuchai 213 I discovered that 95w produced a nice lukewarm, silky vape just as SMOK claimed. The vapor was very dense, the flavor was out of this world, but in order to achieve warm vapor I had to push the wattage to 125w, so once again battery life and ejuice consumption was high. This coil head is seriously astonishing. Even vaping at a full 100w the vapor temperature was only slightly warm. I moved it to 140w to achieve just enough warmth in the vapor and overwhelming flavor. This coil head is possessed by the Devil himself. You can expect the largest clouds you imagine, with extraordinary flavor with a MaxVG eliquid, but should you decide to vape at 140-180 watts, which is easily done, you can expect to almost watch your battery indicator slide down in real time, and that 6mL of ejuice to disappear inside of 20 minutes. 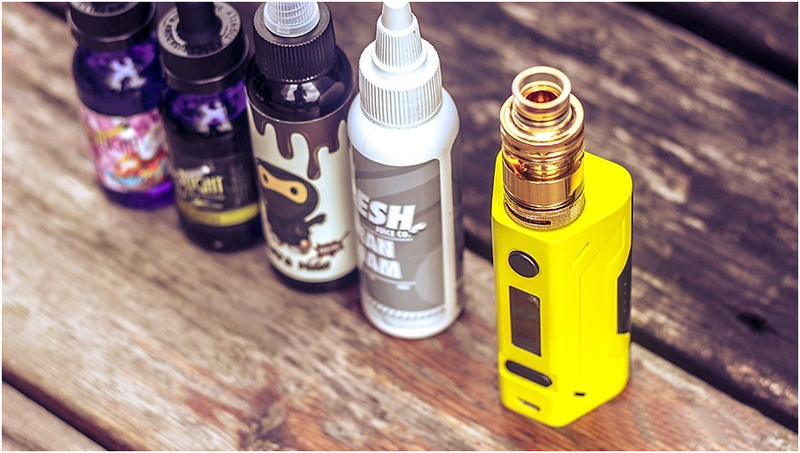 If the user decides that the V8-T8 is the coil head of choice, the user should expect to have a couple of extra “sets” of batteries in waiting, as well as an extra 30mL bottle of ejuice at the ready. The TFV8 RBA coil is an enormous improvement over the RBA for the TFV4. The TFV8 RBA section has an 18mm build deck for making easy work with just about any wire or any build. For builders SMOK outfits the TFV8 with a strong V8 RBA Head (4.0T-X) that includes a pre-installed 0.28ohm Clapton Dual Coils. The build deck features a two-post, dual terminal design that will accommodate a wide variety of build ‘styles’ and coil structures. While the Clapton coils are attached, the user will still have to wick it. Thankfully, SMOK includes some organic cotton to fully wick the RBA. As far as Sub-Ohm Tank RBA components go, the TFV8 is the easiest one I’ve ever worked with. Twist off the coil wall to expose the actual coils, wick it, saturate it, and vape like hell. When it comes to wrapping your own coils there is plenty of room to work with, and as I said above, with so many options for builds, the RBA will easily become the favored component for builders that own the tank. Inside the TFV8 Tank box is everything the user needs, and everything the users get when purchasing the RBA section separately. I fully expected the SMOK TFV8 to cost $49.99. It looks like a $50 tank, and it performs like nothing I’ve used before. 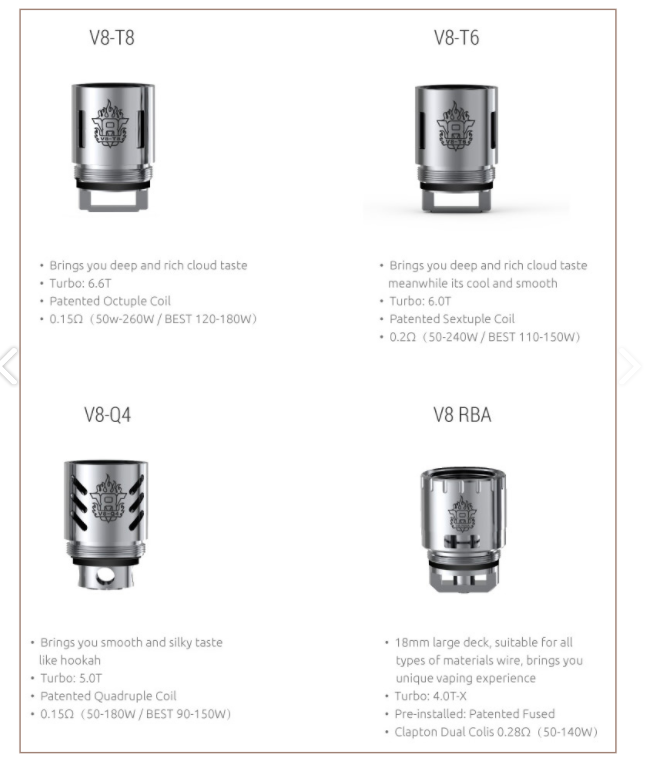 When SMOK went back to the lab to design the TFV8, with all the notes and feedback by users, they came out with a tank that is so vastly improved that I cannot imagine an owner of the TFV4 being happy with that tank when the TFV8 can be had for $1 more. As I’ve said so many times before, just about every sub-ohm tank today provides a good vape, and many provide an excellent vape. 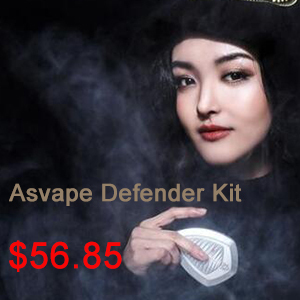 So why should Vapers go out and buy the SMOK TFV8 Cloud Beast? Well, not everyone should. Despite the new shorter height, the TFV8 is still 24.5mm wide, 25.5 at the widest, and it needs plenty of power to push it. If you don’t have a mod that push past the 100w mark, you won’t get all that the TFV8 offers. In fact, if your mod maxes out at 100W, there are better tanks for your needs. The Atom Vapes Metropolis, the Joyetech Ultimo, the eleaf Lemo 3, the Protank 4 by Kanger, and others, are sub-ohm tanks for the 100w and under mods. 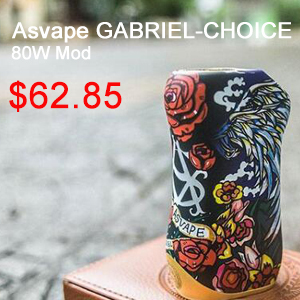 If a Vaper uses a high powered mod, in excess of 150w, then the TFV8 will provide a vape experience like no other. This much-improved ‘TF’ tank is more than a Cloud Beast, though it is a cloud beast, the flavor production is just as “big” as the clouds of vapor. After all, the TF in TFV8 stands for TASTE FURIOUS. A while back we began using the terms “mainstream tanks” and “specialty tanks”, and the SMOK TFV4 was diffidently a ‘specialty tank’. Can the same thing be said about the TFV8? Yes, and No. Certain aspects of the SMOK TFV8 are definitely “specialty”. The very high wattage, the large width, and the huge coil heads. On the other hand, with so many Vapers owning mods that exceed 100w, plenty of those mods have the space for a 24.5mm base, and the excellently balanced flavor/vapor production, I would say that even New Vapers who opt for the high wattage mod, could handle the TFV8 without much of a problem. 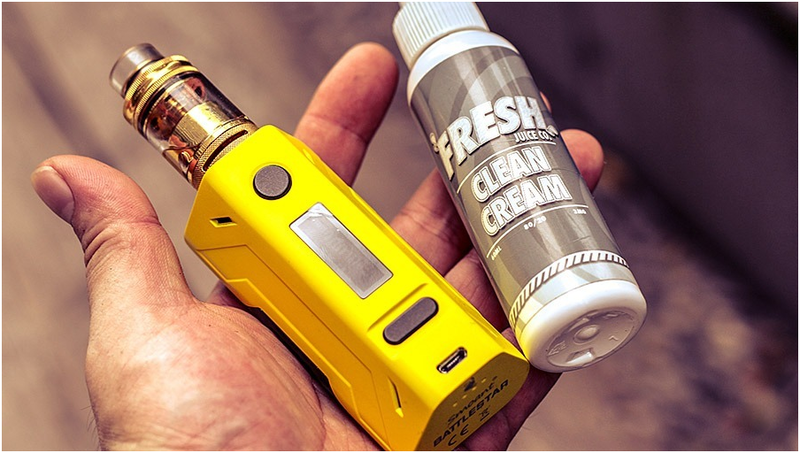 Owners of the SMOK TFV8 will get less battery life and vape through more ejuice than they would with other sub-ohm tanks, But, if that isn’t a problem, the TFV8 will provide a vape experience that can’t be found in any other sub-ohm tank. In the 5 years of vaping, the Smok TFV8 tank surpasses all others in sheer flavor and vapor production. 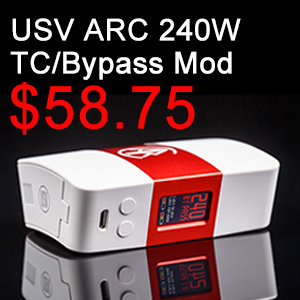 A must-have tank for any Vaper owning a mod that produces more than 100w of power. 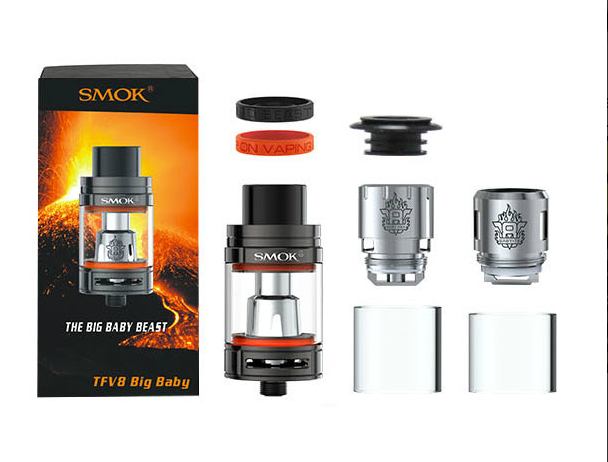 The SMOK TFV8 Big Baby Beast Tank is a fantastic enlarged upgrade from the TFV8 Baby Beast (a tank I use on a daily basis) and a perfect representation of a slightly smaller TFV8 Cloud Beast. Just when you think there’s no middle ground between the two, SMOK hits us with the TFV8 Big Baby Beast! 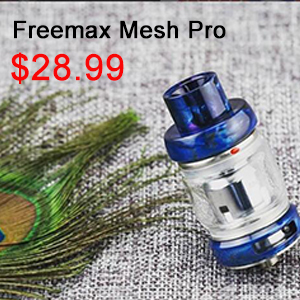 The SMOK TFV8 Big Baby Beast is a 24.5mm Sub-Ohm Tank that utilizes the wide selection of Baby Beast Turbo Engine Coil Heads which makes cross-compatibility extremely convenient. Measuring 3mm taller and a 2.5mm bigger circumference than the Baby Beast while increasing total eJuice capacity by 2ml (to 5ml total); the Taste Flavor V8 Big Baby Beast is definitely a closer rendition to the TFV8 Cloud Beast, in my honest opinion. SMOK struck the perfect balance of not too big (TFV8 Cloud Beast) and not too small (TFV8 Baby Beast) while still being easily transported. It’s definitely not a small tank and feels more in-line with other competing tanks that share the same diameter and juice capacity; there’s nothing baby about it! 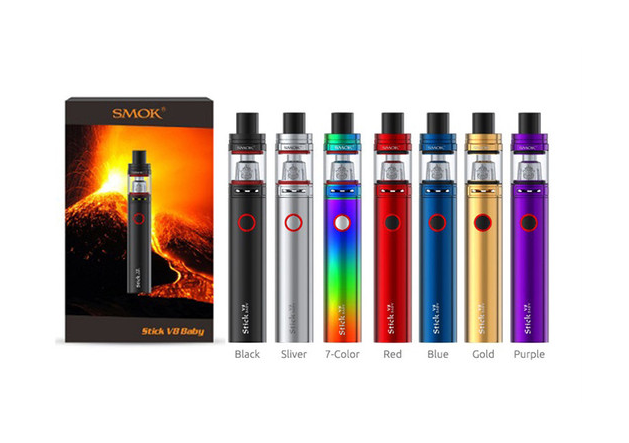 SMOK released a few additional colors to the TFV8 lineup and really makes it easy to pick one to match your style. The TFV8 Big Baby is currently available in Black, Stainless Steel and Gunmetal with Gold, Blue, Red, Green and a Rainbow version called 7-Color being released soon. I’ve been using the Black version that came with the SMOK G-Priv Starter Kit and the Stainless Steel version with the RBA deck installed. The overall construction is as you’d expect; solid and the superior Stainless Steel material used is identical to most other SMOK atomizers. I’ve been using my Cloud Beast and Baby Beast several times weekly and never had something break, wear down or show any sign of failure; a testament to SMOK’s quality control and manufacturing methods. 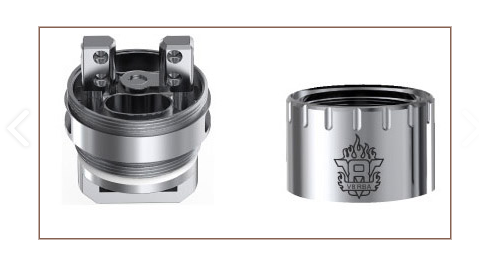 The TFV8 Big Baby Beast shares the same hinge-lock top-fill system that SMOK has perfected over the last year and is hands down the best top-fill in the industry! With a nice amount of tension thanks to the extremely thick fill hole silicone gasket between the tank and top cap, the swinging arm stays closed without any looseness or unhinging whatsoever. The fill hole did decrease in size just a smidge compared to the Baby Beast but I had no issues jamming a 120ml dropper in and filling the full 5ml reservoir. I’m so familiar with the swing open fill port that I wish every manufacturer implemented a similar system to get close to what SMOK has accomplished with theirs. The dual 15mm x 2mm adjustable bottom airflow slots provide the amount of air needed to power the TFV8 Big Baby coils and RBA section. The adjustment ring is super smooth with no hesitation when making changes and stays in any position you set it too. It does stop in the opened and closed positions, which I completely prefer, unlike the Cloud Beast that spins around 360°. The enormous 16mm Delrin wide-bore drip tip (the exact same as the Cloud Beast) still gives a great amount of flavor since it tapers down and connects (by two really strong O-rings) to a 6.9mm chimney. I personally love the larger wide-bore drip tips but SMOK does include a 510 adapter if you want to use your Baby Beast or any other 510 drip tip instead. Never once did I have a heat issue even when running 100W plus. Lying nicely under the packaging were two replacement glass tubes which I thought was unusual but awesome. Then once I went to install the RBA deck, I realized the second additional glass was slightly taller than the others to compensate for the couple millimeters taller the RBA deck stood over the coil heads. The 510 connection threads installed easily on any device I attached it to (mainly the SMOK G-Priv and Lost Vape Triade DNA250 Box Mod) while the 510 center pin gave me no issues with connectivity. With the Baby Turbo Engine Coil Heads providing the vapor and flavor, expect a solid performance from each and every option. Every SMOK coil lately (besides a select few) is unbelievably flavorful, well-built and lasts longer than other brands. The Big Baby Beast uses the same coils as the Baby Beast despite being bigger in diameter and offering almost double the eJuice capacity. I prefer having a couple tanks that use the same coil heads so I only need to stock up on one specific resistancethat I like with the ability to use a variety of tanks. As excited as I was to have the Big Baby RBA section in hand, it’s not compatible with the Baby Beast since the glass is too short for the tank to assemble properly; unfortunate but is still an awesome addition. Of course, I started immediately with the RBA section that comes preinstalled with dual Spaced Clapton coils (5-wrap and 2.5mm ID) reading right around 0.34Ω. Remember you need to install the taller glass tube that’s included in the box or you’re left with an unfillable gap. After some minor adjustments, I wicked it up with some premium cotton (Native Wicks Platinum to be exact) and filled it with some juice that I know like the back of my hand. Once I reached about 70W, the vape was extremely smooth. A cooler vape than I normally prefer but great flavor and clouds upon clouds of vapor. I normally build contact coils (wraps that touch each other rather than spaced apart) so after a couple tanks, I decided to install my own coils. 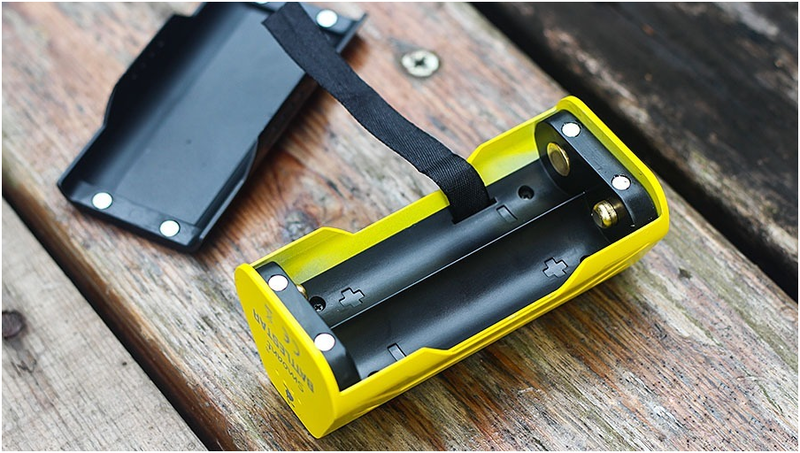 The RBA is a two-post Velocity-style deck that measures 16mm in total diameter with two 2mm holes on each post. The side-tension screws hold your coil leads in place with no issues despite their smaller size. Wicking is similar to the Cloud Beasts included RBA where you tuck your wicks into the corner channels with four 4.3mm x 2.5mm wicking slots around the bottom feeding juice to the cotton. With either a lot of cotton or the bare minimum, I get no leaking, gurgling or spitting with the stock setup or the dual SS316L Clapton coils (7-wrap and 2.5mm ID) I installed shortly after. I was able to push my dual Clapton coils (reading at 0.21Ω) to much higher wattages and was getting a warmer denser vape right around 80-90W. Obviously, you’re going to be limited to smaller builds but the flavor and vapor is right on par with larger more power hungry RBA’s. 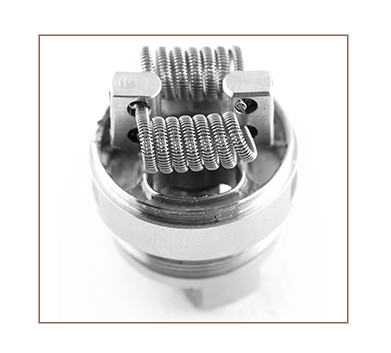 The preinstalled 0.15Ω V8 Baby-X4 coil head consisted of dual parallel (quadruple) coils measuring 2.8mm ID each with four 7mm x 2.5mm wicking slots. The dual coils are placed in the center of the coil giving you direct from the coil vapor production. 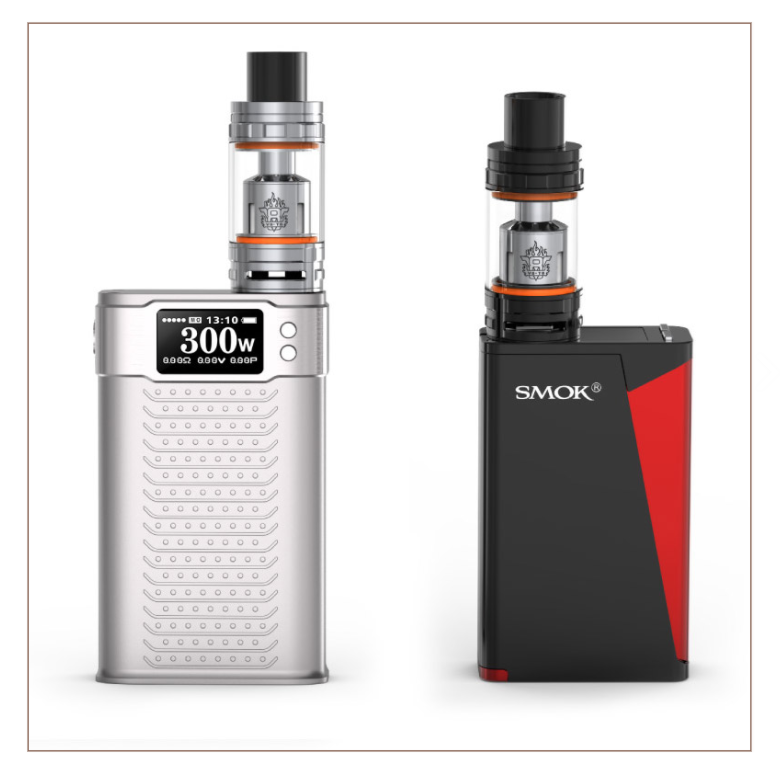 SMOK recommends the best output around 45-60W (with a total range of 30-70W) but I found around 65W was a perfect number for me. I’ve been vaping these coil heads with the TFV8 Baby Beast for months and bought several packs since I do enjoy them a lot. The life of the coil is close to a week of severe vaping before I started getting a change in flavor but overall I enjoy the Baby-X4 coils a lot. Also included in the box is the 0.2Ω V8 Baby-T6 Sextuple coil head, the most powerful coil head in the V8 Baby lineup. With three individual parallel coils (giving you six coils total), a 3mm ID and three 5.5mm x 2.5mm wicking slots, power is drastically increased. The wattage range of 40-130W (best between 70-90W) is a little optimistic. I cranked it gradually to 130W and I was getting a dry hit every other pull. The plumes of vapor are thick and the flavor was definitely more up my alley around 110W. I didn’t get more than a few days of good vaping until I was getting a muted almost musty taste. While I do prefer the higher wattage capability of the T6 (I’m a triple digit vaper at heart), the Baby-X4 is the clear cut winner between the two. While there are several other coil head options that I do vape with my Baby Beast, never once do I get leaking or resistance errors. The coil life varies from person to person so my time is normally cut shorter since I’m constantly reviewing other products. 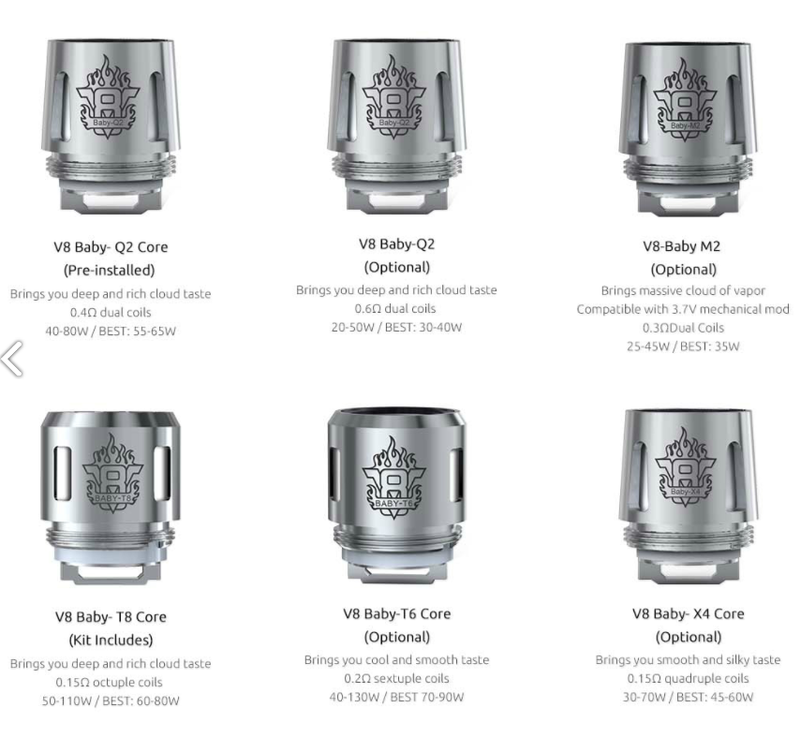 But the only con I came up with on the TFV8 Big Baby is when tightening the top cap down, it loves to hold the top of the coil head. So when I try to remove the top cap, the coil unscrews from the base with it and caused a mess, especially with the RBA section (it took pliers to unscrew the cap on the RBA more than once). It happened the few times I went to clean my tank out and when changing to a different coil (just a friendly heads up). 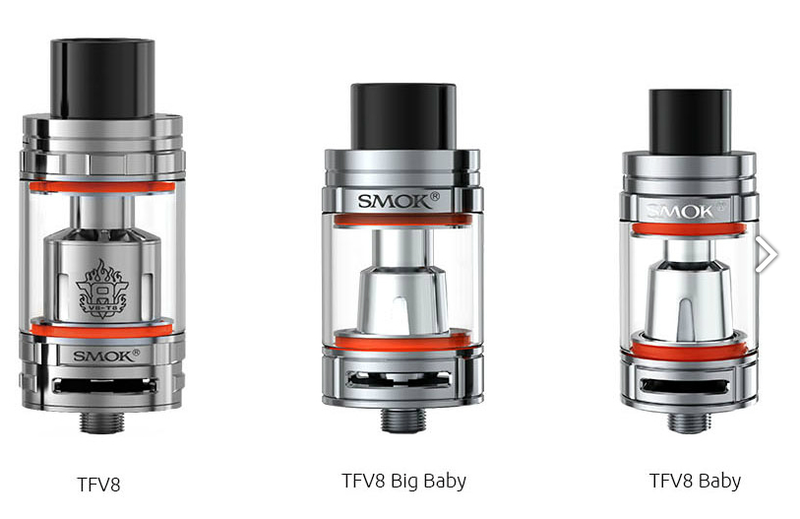 Are you interested in this Smok TFV8 Big Baby Tank? Shop now! 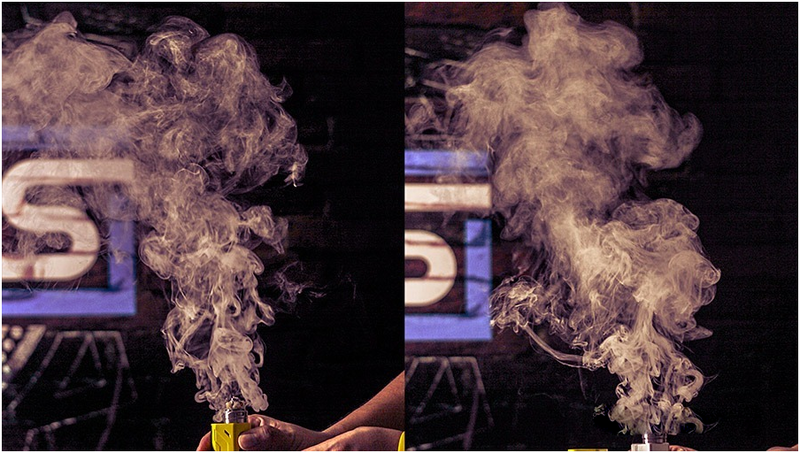 Or if you prefer a bigger size of Smok Tank, TFV8 Cloud Beast will be the best choice! Intro: Smoant Battlestar 200W is an innovative box mod, coming in eight different color schemes! I’ve once analyzed that due to the lack of new technology support, 2016 will witness the race of appearance and function in the e-cig market, on which condition multi-function, easy operation and beautiful appearance will become the new standard for the consumers to select devices. In the aspect of appearance, there are mainly two developing directions: one is the feeling of science and technology, another is Retro Style. 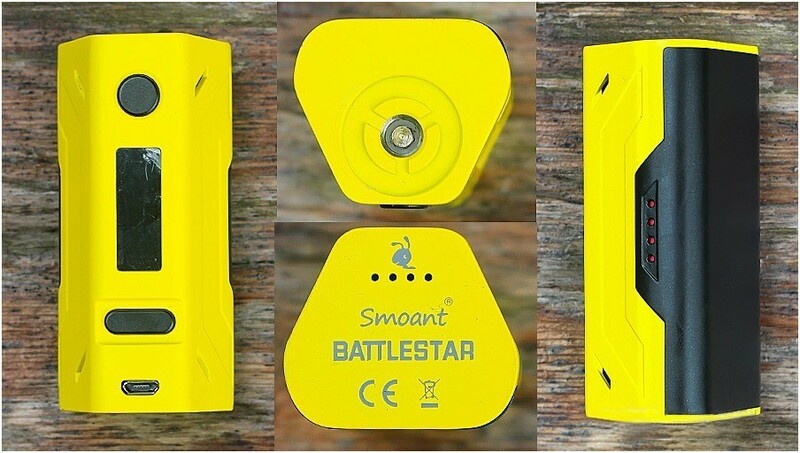 Smoant, the sub-brand of Cloupor, has launched a new e-cig product called Battlestar previously, which has strong sci-fi color about it from the appearance to the name. This dual-18640 200W box has become a focus of attention because of not only its eye-catching appearance, but also its 200W maximum power—could a dual-18650 device really produce the power as high as 200W? What is the output effect of Battlestar? What about its craftsmanship? As I recently has received its sample for test, here I would like to reveal the answers to the above questions for you. 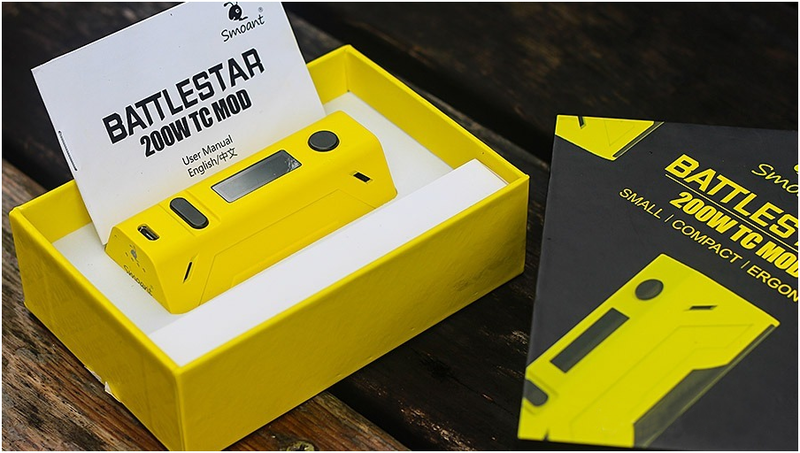 Battlestar 200W adopts paper packaging, whose color scheme is good. The main features of Battlestar is explicitly marked on the paper box: small, compact and ergonomic. On the yellow back face there are more detailed information about the mod. Inside the box there is a Battlestar 200W mod, a bilingual card, a handbook and an accessory box that contains a USB cable and a box of standby magnets. 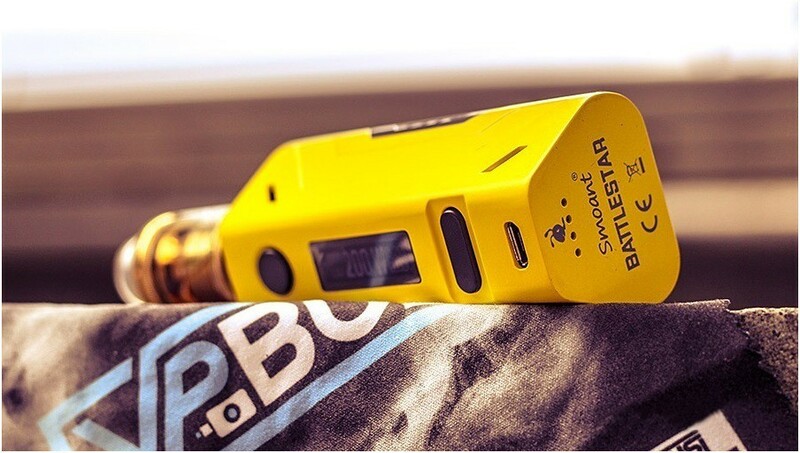 Battlestar, similar to WISMEC RX200, adopts the triangle design that could make the best use of space to reduce the size of the mod. Its appearance is very consistent with its name Battlestar, of which the yellow body and black buttons look conspicuous. The surface of the mod uses anti-proof and wear-resistant rubber paint, ensuring good grip feeling. But some corners’ painting face remains to improve. Nevertheless, the overall stability of the mod is good. 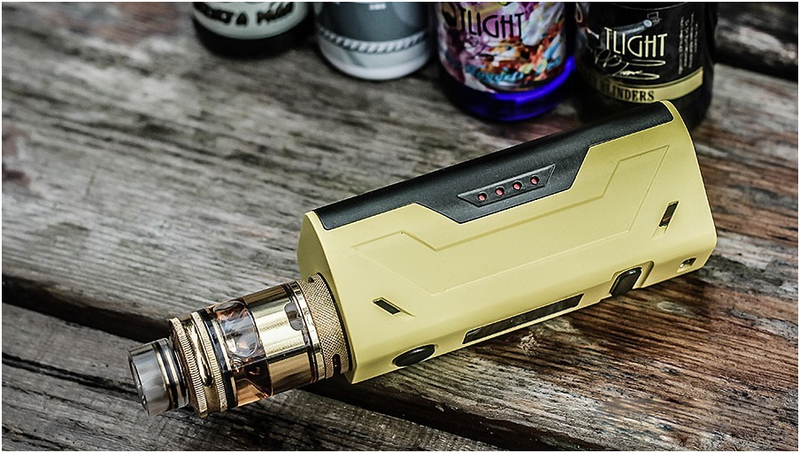 Battlestar 200W adopts the spring 510 connector, which takes up more than half area of the mod’s top. 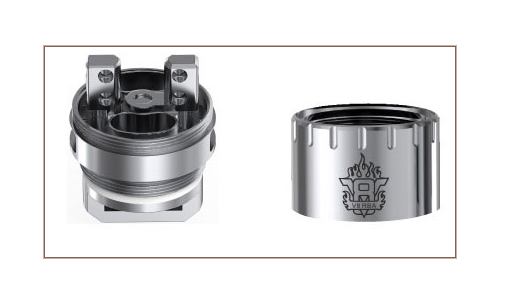 The three grooves around the 510 connector are not appropriate, because they may lead the e-juice leaked from the atomizer into the connector. The operation area of the mod is regular, where the fire button is above the screen and the adjusting buttons are integrated into one single button. The sides of the body have some simple ornamental moldings, and the black battery jar cover also makes the mod less monotonous. To facilitate the heat dissipation of the chip and batteries, there are several venting holes for them. On the bottom of the mod there are also four venting holes for the chip. The protective pasting on the screen could effectively protect it from scraping. The battery jar is fixed to the body through eight magnets. It adopts the snap joint design, thus the connection is compact and firm. The craftsmanship and material of the battery jar are also quality. The two batteries are in series, and the positive poles use spring contact. Maybe it was for the overall effect of the mod, there is no gaps around the battery jar cover for the convenience of opening. For that reason, it may be a little bit difficult to open the cover using our finger nails like usual. The right approach is to hold the mod using one hand, and put another hand’s thumb, index finger and middle finger on the venting holes of the cover, then pull outward hard to open the cover. It really need great strength. 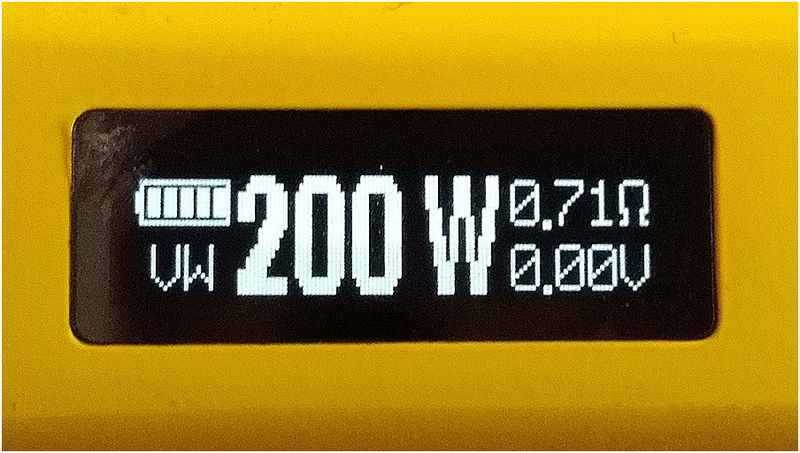 Battlestar 200’s screen display is comprehensive, which consists of the electric quantity, the modes, the power, the resistance, the real-time output voltage and the temperature if under the TC mode. Battlestar 200’s operation is very easy. Just press the power button three times in succession to call up the function menu, and press the adjusting button to shift and press the power button to confirm. Besides the normal VW output, Battlestar also supports the TC modes for Ni200, Ti, SS and NiCr and provides three TCR presets for the users to self-define the TC material. 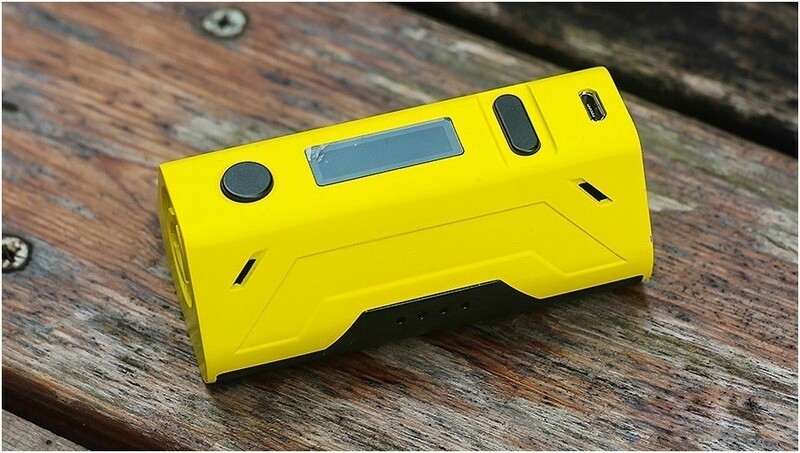 Many vapers doubt that whether two 18650 batteries could really produce the power as high as 200W, though SMOK’s dual-battery H-PRIV 220W has previously been proved to have the same performance as DNA200 under the power of 200W. To address this issue, I’ve made a professional comparison test. I compared the vapor effect of Battlestar 200W and DR200 by using the same atomizer and batteries and ensuring the 100% charge status during the test. Through the picture we could see that Battlestar is inferior to DR200 in vapor volume. Moreover, under 200W, Battlestar has nearly 0.5 second’s latency after firing. In fact, many VW mods have this kind of latency. I think that it’s because most VM mods’ menu and settings are also called up by the power button, therefore it has to leave some time for the chip to react accurately to your command. Since the invention of e-cig, the functions and performances of the devices have all changed a lot, but the operation of most devices still continues the initial method—press the power button five times in succession to power on or lock the device, and press three times in succession to enter into the setting menu. Though some mods specially added the function button to simplify the operation, they have not forms the mainstream. In fact the increasing of a function button is much humanized. It could reduce many tedious steps, save the latency time of the chip and accelerate the device’s reaction time. Though there is possibility of mistakenly touch, but it do more good than harm. Battlestar 200W’s triangle structure reduces the mod’s size. 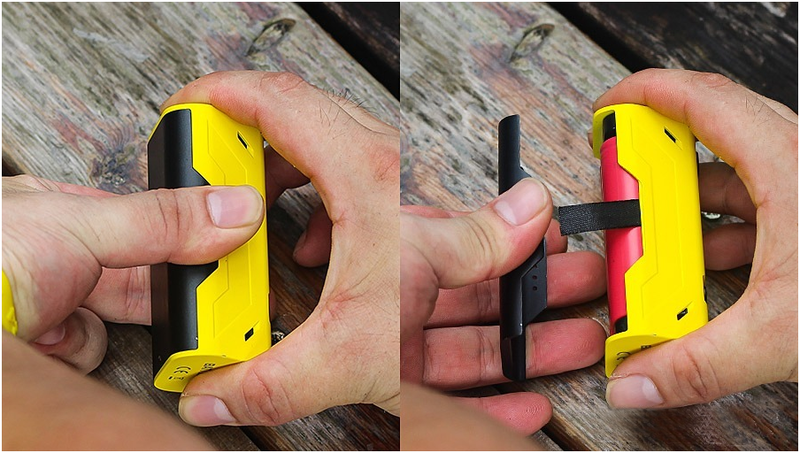 Its dimension of 8.4cm*3cm*4cm is competitive even among single-battery mods. The mod grips comfortable no matter in what way. 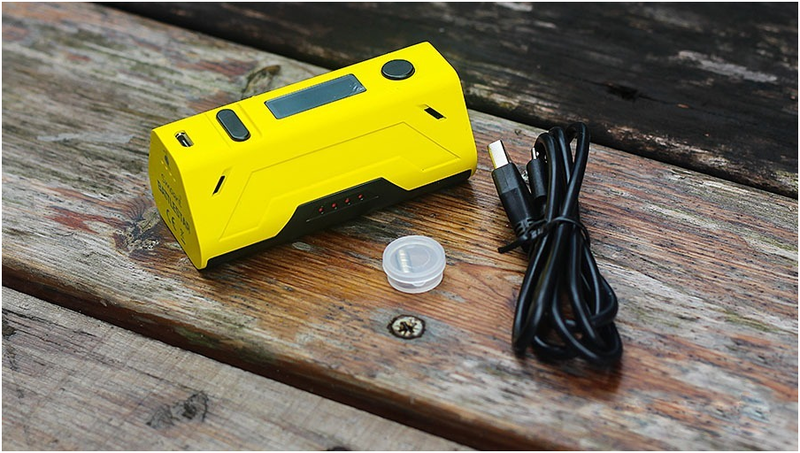 After being installed with two batteries and an atomizer, Battlestar 200W’s weight is still moderate, and it is small and convenient to carry. As for the output, each person has his own requirements and judgment standard. I don’t have professional test instruments to test the authenticity of its claimed 200W output, but you guys could refer to vapor comparison between it and DNA200 above. In the aspect of temp control, I’ve used several sub ohm atomizers to experience the NI, TI and SS modes, and I found that the coils’ heat-up speed is fast, the output is continuous and there is no apparent impulse. The effect is similar to dual-battery mods. Battlestar’s resistance detecting is accurate, and the data is very close to that of the detecting software. Press the power button five times in succession to power on/off; press the power button three times to enter the setting menu; press the adjusting button to shift; and press the fire button to confirm. After the atomizer is installed, the confirm menu will pop up automatically—press “+” to set new resistance and press “-” to set the original resistance. Long press the two sides of the adjusting button simultaneously to change the screen orientation; long press the fire button and “+” to change into the “black character and black background” mode for the purpose of looking clearly the screen under hard light. Long press all the buttons to lock the power and temperature setting to avoid mistakenly pressing that may change the parameters. 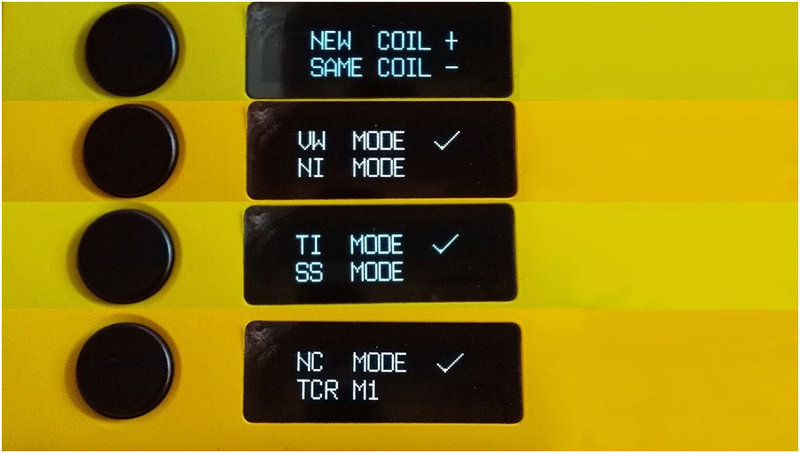 Under the TC mode, long press the power mode and “+” to set the maximum output power. But the mod don’t have the function of locking the device, therefore we have to power off to avoid the mistakenly touching while putting it into the bag. Generally speaking, Battlestar’s operation is simple enough even for newbies. 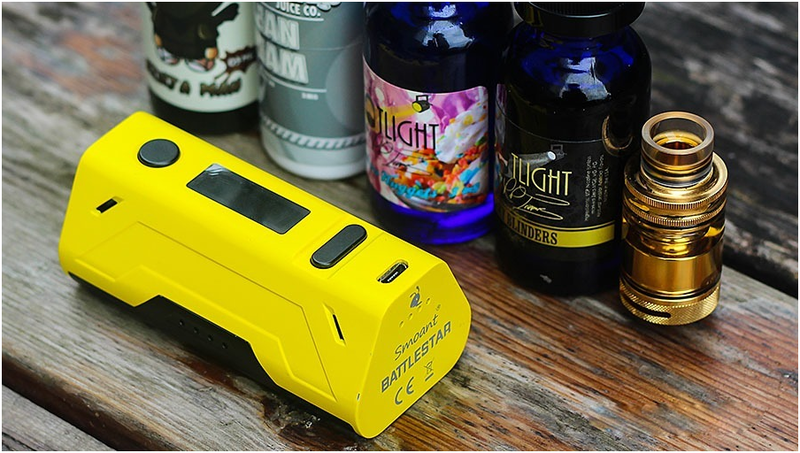 As a small size dual-18650 200W mod that has special appearance and good color scheme, Battlestar 200W is a cost-effective product among like mods. The corners’ painting face may easily peel off if scraped with hard matter, therefore try not to place the mod with hard things like keys, mobile phones and coins. But the overall painting of the mod is firm. The grooves around the 510 connector may lead the leaking e-juice inward, thus frequent cleaning is needed. The 510 positive pole is a little too high, thus it may produce gaps between the mod and the atomizers whose bottom electrodes is projecting. The battery jar cover is difficult to open due to the lack of slot design. 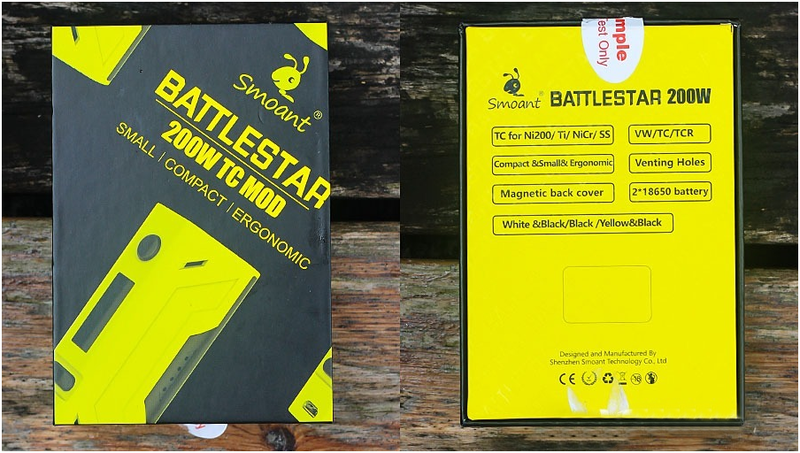 In Summary, Smoant Battlestar 200w box mod is especially unique in appearance and the performance is also satisfying！Worth trying!